for spots around the city are written by other users while utilizing a downloadable map. many find a lack of connection to the culture. Takes a couple international trips a year; Asia and Europe so far. Travels with her boyfriend, Vincenzo, and researches before a trip. Kayla wants to feel satisfied after each trip taken because she is adventurous and sociable. She aims for doing what the locals do! She lacks time for the amount of preparation. She usually gets stuck in “touristy” places and feels let down from some parts of her trip. This beginning layout helped me clarify my ideas and also test existing apps for inspiration. I began iterations of the project involving every aspect that a traveler might want. I hired a graphic designer to help brand and create this app. I narrowed down the app to the necessities; recommendations and downloadable maps. From user testing, as you can see on the left, I tested this while abroad in Florence, Italy. Many users asked “can I download it yet? !” This was due to the ability to save multiple pins of favorite recommended places to one downloadable map. This was a revolutionary idea I discovered. They will can go under “Recommendations” when using data and find new things to do based on their saved map. From there, they can save, as a "Pin," the address of the recommendation on to their downloaded map for reference later or just use their downloaded map regularly still without data! I created this feature to be an emergency call to contact the local police of which ever country you are traveling in or a hotline of a future Fernweh call center to help travelers. This is part of the future vision of Fernweh. How do people hear about apps nowadays? Majority of apps are downloaded from users browsing the App Store. They are downloaded based on existing ratings, images and price (obviously.) But what about travel apps who are trying to reach people who don't want to be on their phones all the time or are trying to get away from those over crowded places? I printed 1,000 stickers of my logo I designed and helped to brand this project. It started as a fun idea, but when I noticed how people placed stickers and their reaction, I decided to innovate a new way of advertising through modern graffiti: stickers! So next steps when this app can be furthered by backed up research and user testing, I will create a link or QR code on the sticker. 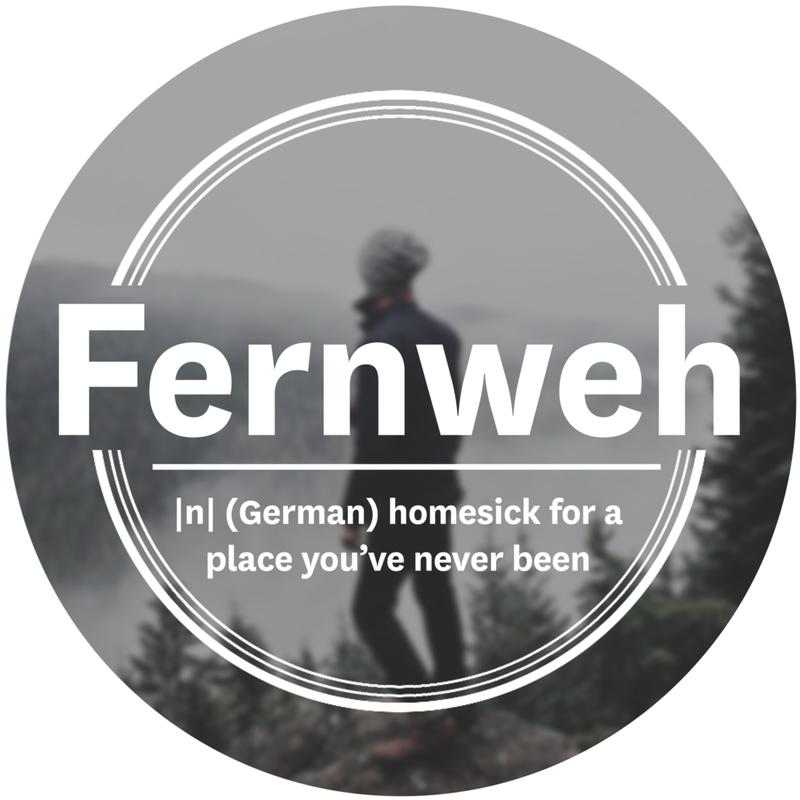 For now, there are thousands of "Fernweh" stickers placed around Boston, San Francisco and even some around European cities.